Hope you all are having a great summer! Got sidetracked with some new projects and travel so my apologies for not posting anything new for a while. But now, I’m back so here goes! The summer has been good for the King of Bollywood, Shah Rukh Khan. The A-lister who continues to be the biggest star in the Indian film industry with millions of fans, is basking in the successful of his film “My Name Is Khan” which recently had its DVD release in the US and the recent honor of being immortalized in the world-famous Madame Tussauds wax museum in NYC recently. Khan, 45, who was named one of Newsweek’s ’50 Most Powerful People in the World’ in 2008 continues to be one of Bollywood’s highest paid actors making millions in brand endorsements, stage shows and hosting television specials in India. But he has also remained as humble by his mega success and is so appreciative of his fans who he believes have kept him going strong in the Indian movie business for almost 20 years! The actor’s latest film “My Name is Khan” has done very well at the box office this and was the highest grossing Indian film in the US so far this year. Released earlier in 2010, the iconic actor co-stars with one of the most sought after actresses in Bollywood today Kajol and the duo came together on-screen after almost a decade. Fox Searchlight was the distributor for the film and from what my sources tell me, they are pretty happy with the results. “My Name is Khan” tells the story of Rizwan (Khan), an Indian muslim living in the US and married to the beautiful Hindu Mandira (Kajol) whose lives are transformed into anguish after the Sept. 11 attacks. Rizwan has Asperger’s Syndrome and is often mistaken for a terrorist after the attacks . To save his marriage and reputation, Rizwan insists on seeing the President of the United States to proclaim his innocence and clear his name. The film with a combination of love and a quest for truth will make you route for the underdog as is most common in Bollywood films. 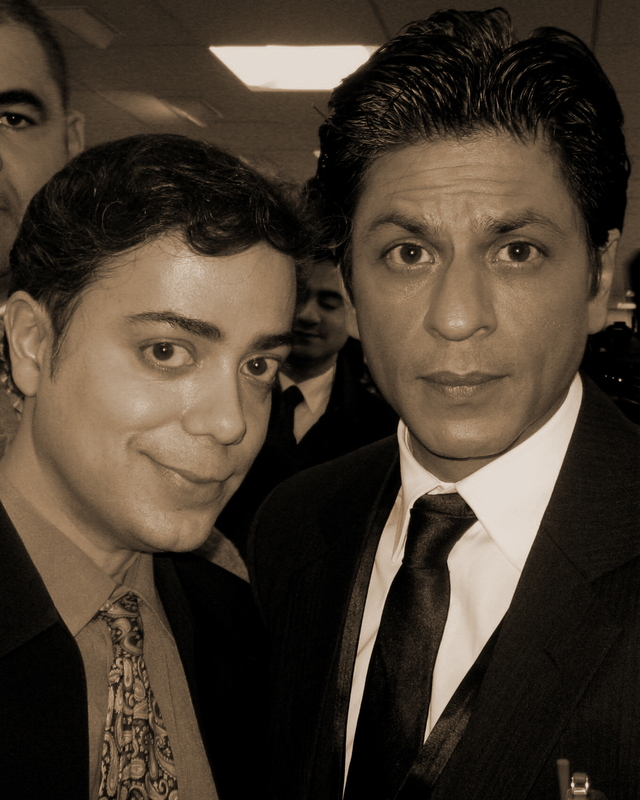 Ravi Yande and Shah Rukh Khan at the NY premiere of "My Name is Khan". Khan and stunning actress Kajol have returned to the screen after many years and their on-screen chemistry is even stronger than before. They have worked together in many films (most of them being box office hits) and are termed the “Royal Couple” of Bollywood due to their regal on-screen presence and loyal following. It’s interesting to note that I first interviewed Khan on Sept 10, 2001, the day before tragedy struck America. He spoke about the incident during our interview and the sadness that comes over him when he talks about it. He also points out that the film is clearly not about the attacks. “I keep getting that question asked of the film” he told The Ravi Report recently. “the movie is about prejudices people go through solely based on who you are as a person or what you look like or for that matter, what your last name is” stated the actor. “My Name is Khan” is co-produced by Khan’s wife Gauri Khan and directed by one of the most prolific and acclaimed young director’s in Bollywood today, Karan Johar. The magnanimous director usually shoots his films outside of India in foreign locations often picking NY or LA as his favorite spots. What’s really intriguing and fascinating about his films is how Bollywood looks at America through the movie lens. But the most enthralling thing that Khan told me was that he hopes their film shows how important tolerance is along with others with different faiths, appearances and of course religion. The film is first that both Khan and Johar have co-produced together. Johar is also one fo the few if not only Bollywood directors to enlist the talents of foreign talent for his movies. He is a genius when it comes to knowing what the public wants. All of his movies have been box office hits. The music for the film scored by the “dream team” of Indian music Shankar, Ehsaan and Loy will bring you to tears. The release of the DVD was in conjunction with the recent installation of Khan at the world famous Madame Tussauds wax museum in NY a few weeks ago. This is Khan’s second statue. He also has a presence at the London branch. The event included beautiful dancers who danced to the music of Khan’s 2007 hit film “Om Shanti Om“. 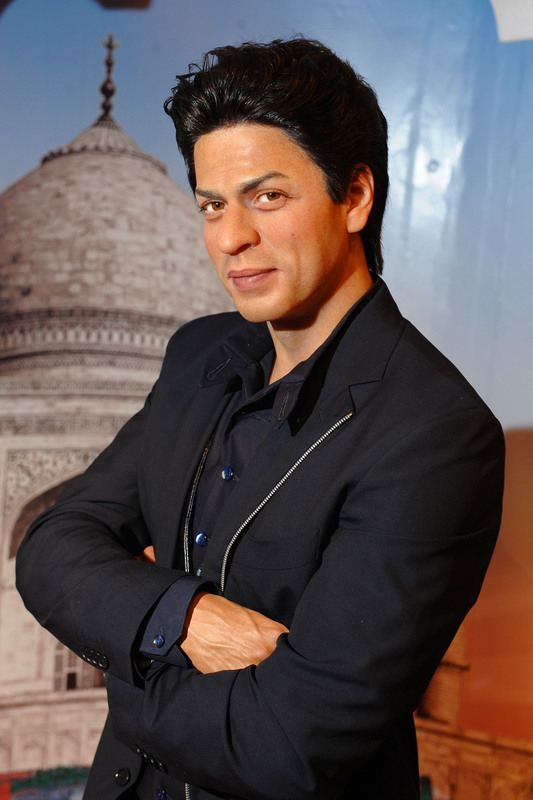 ” I think it’s such a validation for Bollywood to have Khan in with the rest of the world’s prestigious wax figures. He certainly deserves it!” said one beautiful Indian girl who said she skipped work to make it to the event. The museum also has wax figures of iconic Bollywood stars Amitabh Bachchan and his daughter in law, world’s most beautiful woman, Aishwariya Rai. “More and more people are seeing Bollywood as part of the mainstream,” Rosemary del Prado, director of marketing at Madame Tussauds has told the press. For a complete Bollywood tour, check out www.madametussauds.com/newyork for more info. A must see folks!! “I think Khan being in the museum shows that the world is embracing Bollywood even further” said another very attractive and tall Indian lady who was studying acting in NY hoping to make it to Bollywood someday and star in a film with Khan. As I was leaving the event I see an American trying to see what the fuss is about. “Who is Khan?” the young man innocently asks. “Take Elvis, Tom Cruise, Sting and throw in Jay Z and maybe you will get the kind of magnitude that Khan exemplifies in Bollywood” said one turban wearing proud Indian. Khan and Johar are back together again currently in London shooting for their new film “Ra. One” due out early next year. Prepare yourself for another hit. « “SOLITARY MAN” GETS A CHAPLIN!